Learn about Branson, Missouri by reading Branson-A Mountain of Entertainment by Charlie Spence, Aviation Writer. It features a mini, but thorough tour of the destination, plus all you'll need to know to plan your trip including getting there, objective information on places to stay and eat, and things to do. At the end of the article, we've provided a summary of the contact information for your easy reference. Enjoy! One thing you will quickly learn about Branson, Missouri, is that the area is a family vacation spot. There is something here for every age group. This small community in the Ozarks (the census in 2000 showed a population of 6,050) has become an entertainment center with almost 50 theaters, 10 golf courses, more than 200 different lodging facilities, theme parks, lakes, museums, and whatever else might suit your fancy. 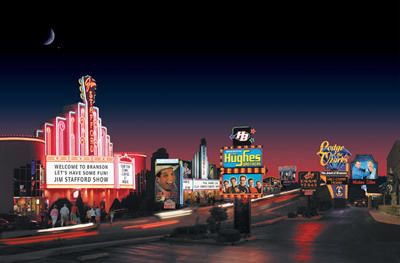 The estimated 7.3 million visitors to the area in 2004 demonstrate the lure of Branson. from nostalgic to current stars. Photo courtesy Branson Update Inc.
shows at the near 50 theaters in Branson. It began as a vacation Mecca in the early 1950s when country music legend Red Foley moved to nearby Springfield to host the “Ozark Jubilee” radio show. By the end of that decade, the Mabe Brothers began performing twice a week in a converted building by the Lake Taneycomo waterfront. Other entertainers began putting on shows and in the 1990s Branson was dubbed the “Country Music Capital.” Now, however, you can choose not only country shows, but also pop, swing, rock ‘n roll, gospel, classical, and Broadway-style productions. There are more than 100 shows and they are offered at various times of the day from breakfast shows to matinees to evening performances. Choose current top performers or go nostalgic and see some of the favorites of decades past. Although the community is best known for its variety of musical shows, you will also find shows of magic acts, acrobats, trick riders, and a diversity to entertain any member of the family. But shows are not the only attraction to this delightful area. Outdoor activities abound. fun lakes in the Branson and Lakes Area. Three lakes with a trout stream are just minutes away from Branson. Lake Taneycomo was originally part of the White River and was formed in 1913 with the completion of the Powersite Dam. It provides what has been called one of the best trout streams in the U.S. Water in the lower lake is considerably warmer than in the upper portion and this difference harbors different species of fish, providing different challenges to the experienced angler. Technically a lake, Taneycomo has the look and feel of a river. And, to make sure you bring in a string of fish, the clear, cool waters are stocked with about three-quarters of a million ten-twelve inch trout annually. Other water activities you can enjoy include boating, jet skiing, snorkeling, tubing, and swimming. In the rolling Ozark Mountains, the area is ideal for hiking, biking, bird watching, or just lying back and enjoying the quiet beauty. Some of the nature parks are inside Branson city limits. Kids, and those regardless of age who have the spirit of kids, will quickly seek out Silver Dollar City. This 50-acre 1880s-theme park has been voted the number one theme park in the world by the International Association of Amusement Parks and Attractions. There are 50 live shows, food, and 60 shops and rides. Even the strong at heart will gasp as the PowderKeg roller coaster speeds them through a black powder mill of yesteryear and then launches them from zero to 53 miles per hour in less than three seconds. You’ll find the modern touch at the 20th century Celebration City theme park, which has dozens of rides, including the Ozark Wildcat wooden roller coaster. The historic Route 66 section sports 1950-60’s era autos with drive-in diners, themed rides and shops. Family members will enjoy go-cart tracks, miniature golf, bumper boats, or roller-skating. Take the scenic railway trip south into Arkansas or north into Missouri for a narrated journey through the Ozarks. If you have time to soak up more culture, go through one or more of the nine museums ranging from a Veteran’s Memorial to Ripley’s Believe It Or Not. There is a toy museum, Hollywood Wax Museum, Roy Rogers and Dale Evans Happy Trails, and others. By all means take time to do some shopping. In Silver Dollar City artisans create heirloom-quality furniture. The area has three outlet malls with more than 200 stores. There are also boutiques, craft and hobby shops, antique stores, art galleries, and other specialty shops. Historic downtown Branson has more than 100 stores, including an old-time five and dime store. Branson is a year-round attraction with different activities for the different seasons and many special events for periods like Ozark Mountain Christmas or Branson Fest in March. The show season offerings usually run from Mid-March through the end of December. As you head for home, you are sure to comment “I wish we had time to some of the other things while we were here.” That’s just an indication you will return soon. The Springfield/Branson Regional Airport serves Branson. Four airlines offer about 70 arrivals and departures daily. Charter, personal, and business planes use the close-by Clark Airport located at the College of the Ozarks. Three taxi services provide transportation within the city. If you are driving, two major north/south highways link Branson with central Missouri and the eastern side of Springfield to the north and Little Rock Arkansas to the south. 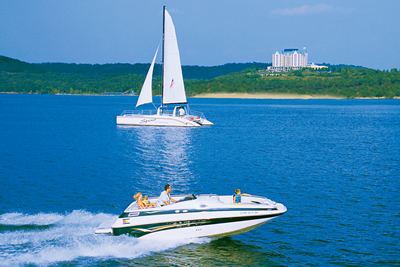 The Branson/Lakes area has just over 200 different lodging places offering nearly 18,000 rooms. These range from a variety of Bed and Breakfast Inns through motels to hotels, offering full-service marinas, to deluxe spas, health and fitness clubs. No matter what your budget or taste, Branson has a lodging to fit it. Many of the facilities have staff members who will gladly assist you in getting tickets to your favorite shows. You can check rates and book your room and rental car with WTA’s Online Travel Booking Service, http://worldtravelers.org/travelservices.asp. From fast food to fine dining, it’s all in the Branson/Lakes area. There are national chain restaurants, buffets, and fine dining rooms. Try the barbeques or homemade apple pie. Many of the places offer sit-down service in their facilities or will deliver your choice to your hotel or resort. Notice: This information is current as of November 2005. It is recommended that you contact the numbers, and/or visit the web sites above to determine any changes to the information.